Live Soccer TV is a unique website designed for football fans all around the world. We provide official TV, online and radio broadcast schedules for your favorite national teams, clubs, leagues and competitions. Live Soccer TV also delivers a weekly e-mail newsletter with the most up to date TV listings for upcoming live soccer matches. 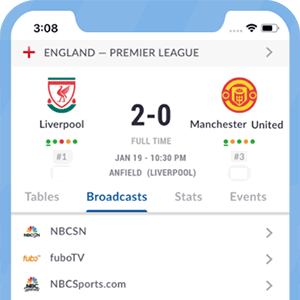 Live Soccer TV is the definitive go-to source for football broadcast data. Advertising on Live Soccer TV is an effective method of targeting ardent soccer fans everywhere. For advertising enquiries, please use our contact form.